East Winds in St Lucia is a premium all-inclusive resort on La Brelotte Bay, set in twelve acres of tropical gardens abundant with colourful plants and exotic birds. This luxury, boutique hotel is set beside a secluded, sandy beach and is a firm favourite of Tropic Breeze’s founder, Jo Plummer as well as many of our clients. The unique property is perfect for those looking to completely unwind in an elegant and informal retreat, with outstanding food and plenty of things to do. Accommodation at East Winds is in 26 semi-detached cottages which are dotted around the spacious grounds as well as three luxurious Oceanfront Rooms and an Oceanfront Suite are located in the former private residence of the Horlicks family. Cottages are brigh and typically Caribbean with tiled floors, wooden furniture, colourful fabricsand private patios, while the oceanfront rooms share an open-air lounge and feature spacious sun decks with lovely sea views. Dining at East Winds is exceptional with a focus on good quality ingredients - local produce is used wherever possible, from freshly caught fish to vegetables grown by local farmers and herbs from the resort's own herb garden. All meals are served at the beachfront restaurant, The Flamboyant Room - breakfast is buffet-style with an open-air grill, a buffet lunch includes plenty of Caribbean dishes while dinner is a four-course menu six nights per week including international and Caribbean dishes. The famous lobster barbecue takes place once a week on the beach, where there are also thatched gazebos that can be reserved for a private dinner with a personal waiter. Afternoon tea is served in the Bamboo Lounge where an all day snack menu is also available. The hotel offers an extensive range of wines, while Champagne is served by the glass throughout the day and cocktails are created by the friendly bar staff. Local bands regularly play at East Winds, with gentle live entertainment often provided on the Caribbean’s first Steinway grand piano. The open air Spa Pavilion is a soothing setting with two private treatment rooms, where a range of massages and beauty treatments are on offer. Guests can enjoy four complimentary yoga or pilates classes each week, while the outdoor fitness area and hiking trail offer additional spaces for light exercise. The watersports team offers Hobie Cat sailing (with lessons if requested), snorkelling, stand up paddle boarding and kayaking. There is a range of tours and excursions such as visiting the island’s botanical gardens, exploring the sulphur springs or hiking the Piton. Golf can also be arranged at a nearby course as well as scuba diving, deep sea fishing or whale watching trips. Guests will receive a personal concierge service who will help with any arrangements. The gardens at East Winds are often a point of interest for guests as the gardens feature over 100 different flowers and plants - there is even a guidebook available in your room to help you identify the tropical flowers. A haven of tranquility! Call us on 01752 880 880 to speak to our friendly travel specialists about East Winds! 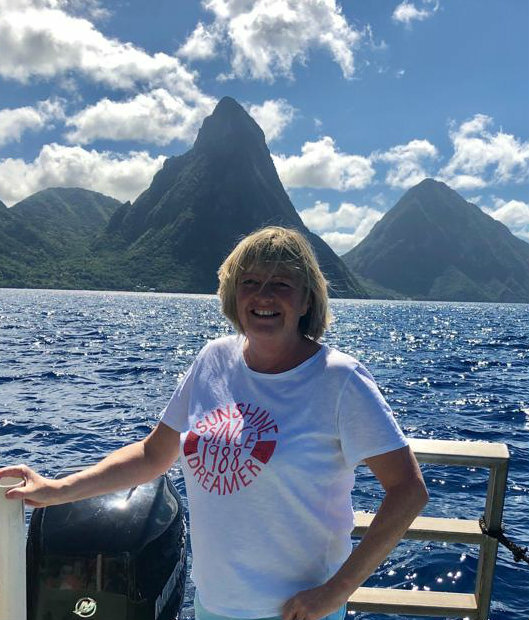 For more information about East Winds or alternative resorts, take a look at Su's St Lucia Trip Diary. Arriving at East Winds, my first thought was how pretty the gardens were, with lovely cottages dotted about leading down towards the pool and beach. I particularly liked the Deluxe Cottages with their lovely verandah - a really nice place to sit and watch the world go by. I thought the self service swim up bar at the pool was a great idea, and the lovely loungers on the surrounding terrace looked like a very comfortable place to relax. The open air spa and yoga pavilion set in the gardens added to the peaceful feel of the resort. The restaurant and bar area are a lovely setting for a pre-dinner drink - as Champagne is included it would be a fantastic place to end a relaxing day! Dinner was particularly enjoyable with a great atmosphere, enhanced by the accompanying pianist who took requests and really added to the ambience. I really loved the feel of East Winds, with great friendly staff and such a pretty setting I thought it was the perfect resort for a relaxing, special break. Children: Children aged between 8 - 15 years old are welcome year round. Distance from international airport: 1 hour and 30 minutes by car from Hewanorra International Airport. To get there in style, helicopter transfers are also available between Hewanorra International Airport and George F.L Charles Airport, taking approximately 10 minutes plus a drive of about 15 minutes between the airport and the resort. Helicopter transfers cost around £150 each way - ask our Caribbean specialists for more information. Location: East Winds is set in La Brelotte Bay on the north west coast of St Lucia. Facilities: East Winds has one restaurant (The Flamboyant Room), three bars including one swim-up pool bar, watersports such as kayaking and Hobie cats for dinghy sailing, an air-conditioned gym, a yoga pavilion with classes, a boutique shop and a walking or jogging track through the resort’s grounds. This is also a range of tours that can be booked with the hotel concierge team allowing guests to explore all of St Lucia’s beauty. Meal Arrangements: Stays at East Winds are on an all-inclusive basis. The premium all-inclusive package includes breakfast (a la carte and buffet options), lunch (served either in the restaurant or as a beach hamper), afternoon tea and dinner (a four course, a la carte dinner six nights per week and a weekly barbeque once per week). Also included are beverages by the glass including wine, beer, spirits, cocktails and soft drinks. Champagne is also served during bar opening hours, and a fully stocked mini fridge in guest bedrooms includes alcoholic and non-alcoholic beverages. .
Entertainment: East Winds offers various evening entertainment from local bands to individual performances on the piano. Entertainment varies from summer to winter but, throughout the year, performances can be expected at least four times a week. Check In/Out: Guests are invited to check in at 3pm (with some flexibility if your room is ready earlier) and check out at 12 noon. Dress Code: During the evening guests are asked to dress smartly with no shorts or t-shirts. Smart jeans can be worn. This dress code also applies to boys from age 6 and above. Well Being: Open Air Spa Pavilion is a soothing setting with two private treatment rooms where a range of massages and beauty treatments are on offer. Guests can enjoy four complimentary yoga or pilates classes each week, while the outdoor fitness area and hiking trail offer additional spaces for light exercise. As a small and boutique resort, East Winds has only 30 rooms, 26 of which are set in semi detached cottages, plus three Ocean View Rooms and one Suite. Each room features a king size bed (twin beds on request at time of booking), air conditioning, a ceiling fan, a fridge stocked with soft drinks and beer, a safe, a private bathroom, coffee and tea making facilities and a terrace. Superior Cottage: Set in the resort’s gardens and near to the pool, beach and restaurants, these rooms feature a king sized bed (twins on request), a new bathroom with a spacious walk in shower and a terrace overlooking the gardens. These rooms can sleep two adults or two adults and two children under 12 on two rollaway beds. Deluxe Cottage: These very spacious suites are set in semi detached, gingerbread style cottages in the resort’s gardens. Featuring a king size bed (twins on request), a large bathroom with his and hers sinks, a separate dressing area and a large terrace. These suites can accommodate two adults or two adults and one child under the age of 16 on a rollaway bed. Oceanfront Room: Following the renovation of a large beach house (once resided in by the Horlicks family for their winter holidays), these spacious rooms offer beautiful sea views from their wooden verandah. Inside, you will find a king sized bed and a bathroom. These rooms can accommodate two adults. Oceanfront Suite: Set in the refurbished cottage, this ocean view suite offers a bedroom with a king sized bed and a separate living area leading out to a private sundeck with sun loungers and a dining table. The Ocean View Suite accommodates two adults and 1 child. Two Bedroom Cottages are also available - speak to one of our specialists for more details.